The contrast between Israel and Hizbollah couldn't be greater. The summer war in Lebanon provided an exceptional opportunity to do further theoretical development in Generational Dynamics in the context of a brief, transparent war. Of particular interest was the sharp contrast in "fighting styles" between the two belligerents, based on the fact that they were in completely different generational eras. Israel is in a generational Crisis era. They fought it as an "existential" war, and with a great deal of fury and passion and panic. At first Israel was planning to use air power alone; then they started calling up reservists, turning it into a ground war. The size of the ground war kept increasing, as Israel had to change course and bring up more reservists. After the U.N. passed the ceasefire resolution, Israel increased the ground war still further to gain as much ground as possible before the ceasefire took effect. Lebanon is in a generational Awakening era, and therefore so are the terrorists of Hizbollah. They fought the war, as I described in my analysis as the war was starting, as "a war from the comfort of home." They sent thousands of missiles into Israel, launching from sites near their own homes. Hizbollah approached the war in a cool, methodical manner, implementing plans that had been in place for years, in contrast to Israel's "hot," panicky war style. Note that if Hizbollah had adopted Israel's war style, then the terrorists would have crossed the border to attack and kill Israeli families in their homes. What's amazing is how faithfully both belligerents followed their generational scripts in their fighting styles. And the perception of most people is that Hizbollah won the war. This means that Hizbollah's "cool," methodical fighting style won over Israel's "hot," furious fighting style. But now a new analysis of the war, based on the findings of a military investigation committee, indicates that Israel was even more panicky and wild than was previously thought. After Hizbollah abducted the soldiers, Israel rushed into war within four hours. Pushing Hizbollah away from the border. There was no plan to achieve any of these objectives. According to Avnery, no plan could have achieved all of these objectives anyway. Some of the aims -- the destruction of Hizbollah or the elimination of the missiles -- were impossible anyway. Contingency plans that had been prepared in advance were ignored, and the war was conducted by improvisation. When it finally became evident that air power alone was not accomplishing anything, troops were sent into Lebanon in a haphazard way, with no plans and no timetables. As a results, the ground operations were completely ineffective. "It is a picture of utter confusion," according to Avnery: "improvised operations, an anarchic command structure, misunderstanding of orders, orders that were issued, canceled, and issued again, General Staff officers giving orders directly to subordinate commanders bypassing the chain of command." This is exactly what happens to a population when it enters a Generational Crisis era, when the survivors of the previous Crisis War have almost all disappeared. The post-war generations have lost their parents, and they've also lost the only people in their lives who know what's going on in the world. As a result, when something goes wrong in a Crisis Era, the people get anxious, and eventually panicky. That's the difference between a crisis and non-crisis war. In the 1991 Gulf War (a non-crisis war), we had a specific objective (eject Iraq from Kuwait), we went in with a plan, and when we reached that goal we stopped, resisting the temptation to go after Saddam Hussein. The 2003 Gulf War occurred early enough in the Crisis Era so that there was still plenty of clear planning, but many people would now claim that the planning was insufficient. And now Americans are showing signs of the same kind of panic that the Israelis showed: There's talk of sending tens of thousands more soldiers into Iraq without a completely clear and attainable objective. Avnery points out that, thanks to generational changes, today's military leaders are much less capable than those who won Israel's "Six Day War," fought in 1967: "In today's army, there is no officer on active service who remembers the Israel Defense Forces from before the occupation - the army that grew up in the "small" Israel within the Green Line, which defeated five Arab armies in six days, commanded by the brilliant General Staff under Yitzhak Rabin. All the commanders of the Second Lebanon War started their career when it was already an occupation army. The last military success of the Israeli army was achieved early in the occupation period, a generation ago, in the Yom Kippur war." Of course, the officers who fought the 1967 war were the survivors of the 1940s crisis war fought with the Arabs when Palestine was partitioned and Israel was created. Remarkably, and unusually, Avnery is making a Generational Dynamics point: That once the survivors of the previous crisis war are gone, the new leaders are far more uncertain, far more anxious, and far less competent. As I've said many times, America's Boomer generation literally has no skills (except technical skills). The previous generation of Americans defeated the Nazis and beat the Depression, then set up structures like the United Nations, World Bank, and World Health Organization to manage the world, and then ran them for decades. The new generation of Boomers not only can't form such organizations, they can't even run them. 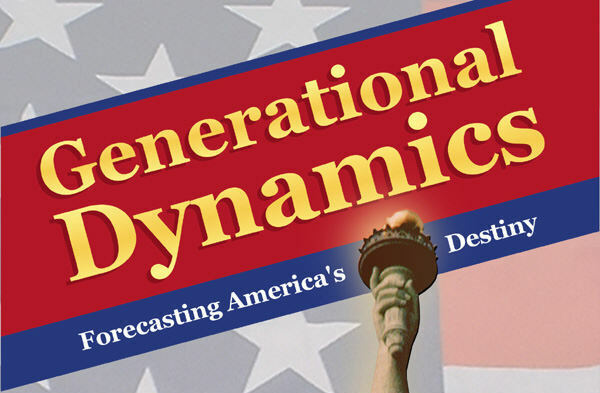 A similar show of generational incompetence occurred prior to our last crisis war, World War II. At that time, we were totally unprepared for the attack on Pearl Harbor. We had plenty of aircraft to defend ourselves, but they remained on the ground, huddled together for warmth, while their pilots were lounging in bed with their girlfriends. We had plenty of anti-aircraft weaponry on the ships docked in Pearl Harbor, but the sailors who were supposed to be manning them were down in the game room arguing over who'd scored the last point. We even had radar. There was an experimental radar installation on Pearl that actually spotted the Japanese aircraft long before they arrived, but no one actually believed that it was possible, so the sightings were ignored. Thanks to this generational incompetence, the Japanese destroyed almost the entire Pacific fleet in a few hours, before we even had a clue what was going on. Donald Rumsfeld, who was born in 1932 and remembers well from his childhood how shocked everyone was about Pearl, is gone now, replaced by Robert Gates, a fine man but a Boomer, because the Boomer politicians and journalists in Washington wanted someone as incompetent as they are running the Department of Defense. Earlier this week I heard a pundit on TV -- I think he must have been a conservative, and he was certainly a Boomer -- complaining that the Iraq war shows that America is losing its will to fight a war, and that if there's a terrorist attack or some other setback, Americans still won't have the will to fight back. Boy is that wrong. These guys have no idea at all what's going to happen. Say there's another major terrorist attack on American soil. Americans will be absolutely furious and demand revenge. Far from being unwilling to fight, their anxiety will turn to panic, and we'll be at war before you can say Jack Robinson. Not possible, you say? Well, that's what happened in Israel this past summer, isn't it? They panicked and they were at war, without a plan, in four hours. And it was about as close to a disaster as can be without actually being a disaster. And to this day, the abducted soldiers still haven't been returned to Israel.